This study was funded by the UK government, however the views expressed do not necessarily reflect the UK government’s official policies. 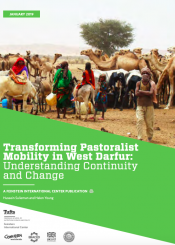 This report investigates the practice of pastoralism in Sudan. The authors delineate migration patterns and rationales as well as market strategies, and also offer recommendations for policymakers and service providers interacting with any community that includes pastoralists.